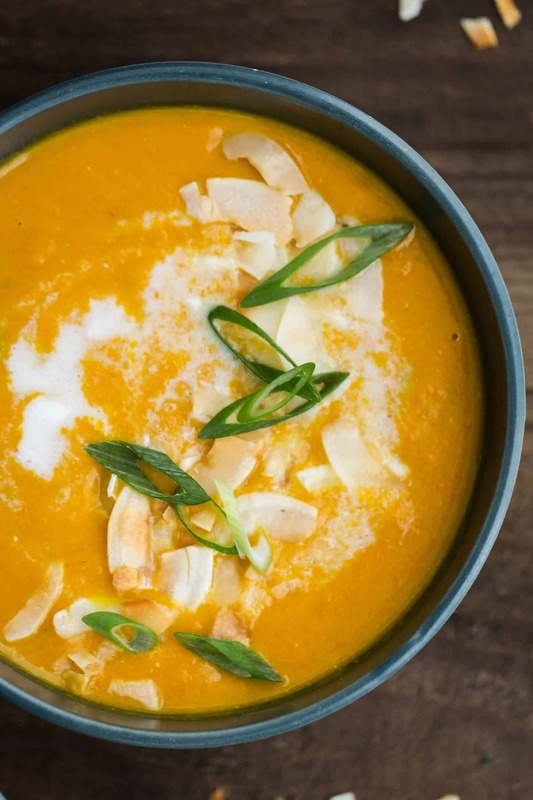 This hearty carrot soup gets help from store bought curry powder and red lentils for an extra boost of protein. Best of all, this soup is gluten-free and vegan. In a large pot, heat olive oil over medium heat. Add scallions and carrots. 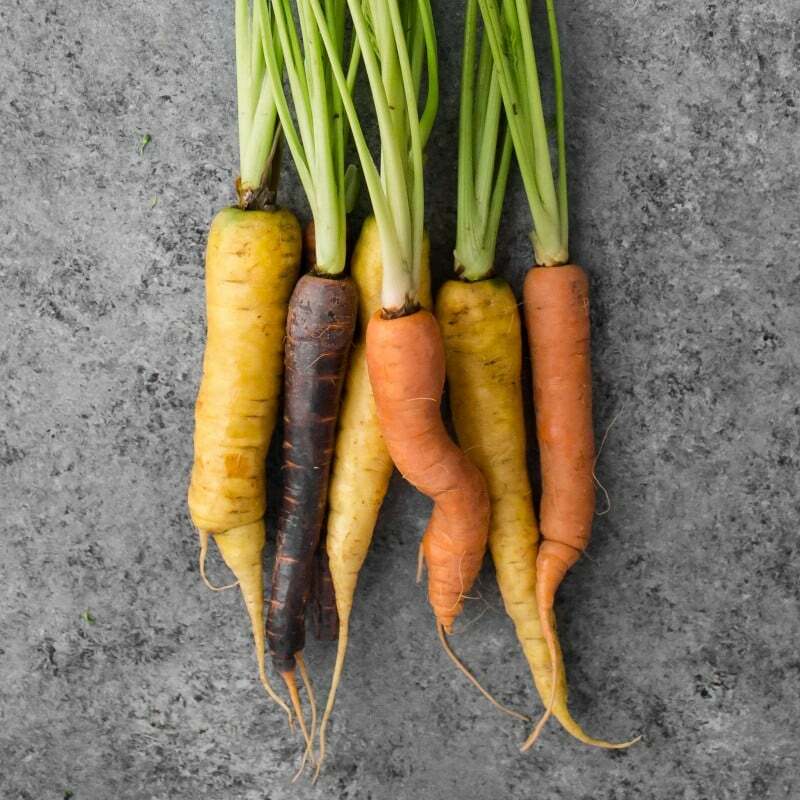 Let cook for 4 to 5 minutes or until carrots begin to soften. Next, add lentils, curry powder, ginger. Stir and let cook until spices become fragrant, 1 to 2 minutes. Stir in veggie broth and bring to a boil then reduce to a simmer, cooking until lentils are soft, 10 to 15 minutes. Remove from heat and using either an immersion blender or a regular blender, puree until soup is smooth. Return soup back to stove, stir in coconut milk, and heat soup for another few minutes, adding spices and salt to taste. Tips & Tricks: Depending on the heat level of your curry powder, you may want to add 1 teaspoon of chili powder to the soup for a bit of extra spice. Cover the pot while you simmer the lentils and the vegetables. It will help them cook more quickly and you won’t lose as much liquid. 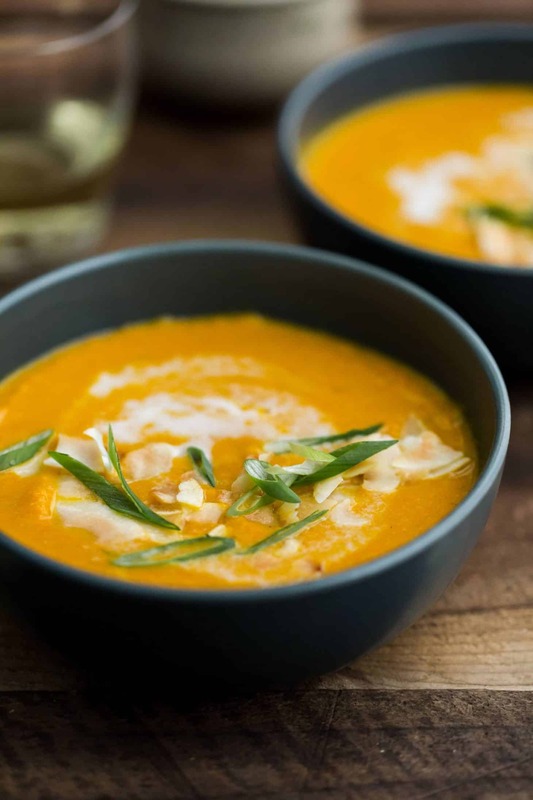 This carrot soup is an easy mix of vegetables, broth, legumes, and spices. With that formula, you can mix and match as needed or base the soup on what you have on hand. Also, I use an immersion blender but you can transfer the soup to a high-speed blender which can make the soup smooth without passing it through a sieve. 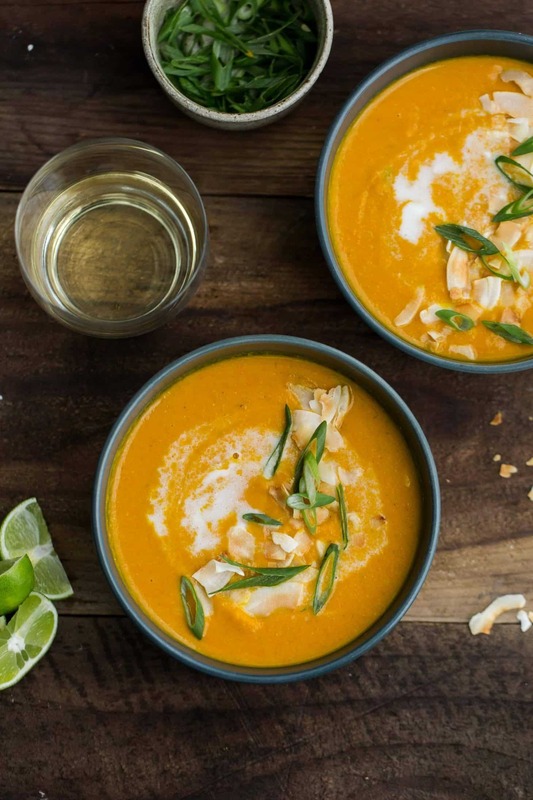 Squash: Try this soup with a hard winter squash such as butternut or acorn instead of carrot. Peel, cube, and boil the squash in the broth with spices about 25 to 35 minutes until very soft. Then blend as above. Cream: Don’t have coconut milk? You can use heavy cream instead or try it with your favorite nut milk to keep it vegan. Legumes: Change up the legumes and use cooked chickpeas or white beans in place of lentils. Originally published on June 27th, 2011. Last updated on October 29th, 2016. Did you use canned lentils or dried lentils? I’m bookmarking this one 😀 I had a curried chickpea salad last week and have been craving more curry ever since. And I love that this one’s vegan! This sounds amazing. 27% is huge. I have been planning my weeks quite specifically and only buying what i need, it really feels great to come to the end of the week and have an empty fridge. Ahhhhhhh! YUM! 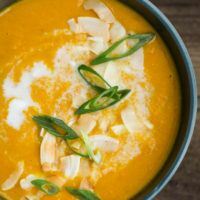 I have made a curried carrot soup before and absolutely loved it! I need to do it again. Yours looks awesome with the lentils in it! This looks incredible, thank you so much for sharing it! Just came across your blog. What delicious recipes you have. Can’t wait to check them out! I just made this and it was amazing! I had more than 5 carrots to use, so I tweaked the recipe a little, and I reallllly like curry, so I added more in at the end, but this recipe is the bomb! So delicious!! I just made this! It’s great. Had to use chicken stock, but such is life. Do you soak the lentils before making this soup? I don’t ever soak lentils- they cook up just fine without it! This was so easy to make and so good! My family really enjoyed! Yum! Yum! Erin, another winner. So, I’m sitting around the house @ 5am getting ready for work, and realized I had nothing for lunch. Yippee, I’ll go buy some expensive unhealthy yet delicious lunch. Boo, I have lots of veggies from the CSA box I picked up last night. So, I found this one, and had all of the items, sorta. In an effort to speed things up, I ran the carrots thru the juicer, dumped pulp and juice into my dutch oven with onions, cooked & added curry, lentils, and found my secret stash of frozen grated ginger from last month. Voila! start to finish, 30 minutes, lunch for several days! BTW, it is really delicious. HI Erin, do you think I could substitute coconut milk for soy milk? I actually think that would be better! I wasn’t really using coconut milk when I first made this recipe but now I would definitely use it in place of the soy! This looks/sound so good! Just what I fancy eating in this autumnal weather. I feel like this will also be a great one to make when feeling unwell! This looks delicious! Bookmarked for the next time I pick up a bunch of carrots. Made this today. Delicious. I added a pinch of granulated garlic, some red chili pepper flakes (like five or six flakes!) and some butter. I used half a can of chick peas instead of the lentils and sweet onion instead of scallions. And chicken broth. And a whole can of coconut milk. Oink, oink. Awesome. Made this for dinner and loved it! Added extra coriander and ate it over rice so it are more like a sauce but it was sinfully good!! I am in the Dominican and could not find red lentils. I used yellow split peas instead and they worked equally well! Delicious recipe! Just made this easy yummy soup! Kept a cup of it chunky and pureed the rest. Served it over jasmine rice, topped with an extra drizzle of coconut milk and toasted pumpkin seeds. If I had fresh parsley I’d sprinkle some of that on, too. I love easy recipes that come mostly from the pantry!